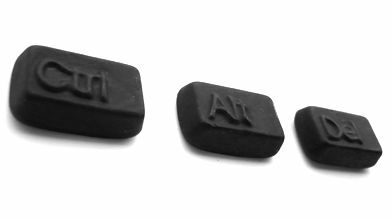 Being the uber computer geek that I am, I can’t help but love these Ctrl-Alt-Delete candies, despite the fact that they are made with black licorice (YUCK). I’m sure Caitlin, our licorice expert would LOVE these. If they only made these in red “licorice” I’d definitely have to get some. Unfortunately, they are all sold out right now and there is no indication of when/if they will be back in stock.